Here at Petite Princess, we are always observing the trends that children are excited about. Next to mermaids, unicorns are everywhere and we couldn’t be happier! We love all things rainbow and sparkly, so we decided to introduce our very first custom character to the lineup; the Unicorn Princess! This magical princess evolved from the dreams and imaginations of our team and she is bursting with excitement to meet her new human friends. Not only did we create her entire look, we developed a story line and custom party package for this special princess as well. Our Unicorn Princess will travel anywhere in South Louisiana. 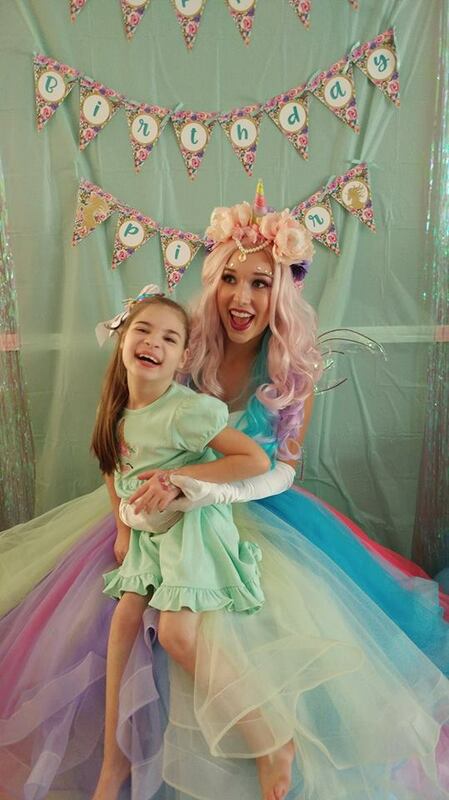 Our Unicorn Princess party package is one full hour of entertainment which includes a meet and greet and photo ops, story time with the “Uni the Unicorn” book, singalong, unicorn sparkle tattoos and jewels, bubbles, a special magic charm necklace (for birthday girl), and of course the happy birthday song. Pricing is $225 for the hour, travel fees may apply. An assistant accompanies the unicorn princess to parties to help with makeovers and other party needs. If you would like to introduce your child to the song we will be singing ahead of time, you can find it here: Uni the Unicorn Song. But beware, it is very catchy and you will be singing it all day! Bring the magic of the fantasy world of unicorns to your child’s next birthday and let us handle the entertainment! Call 225-347-1981 or book online here. Watch her in action here!